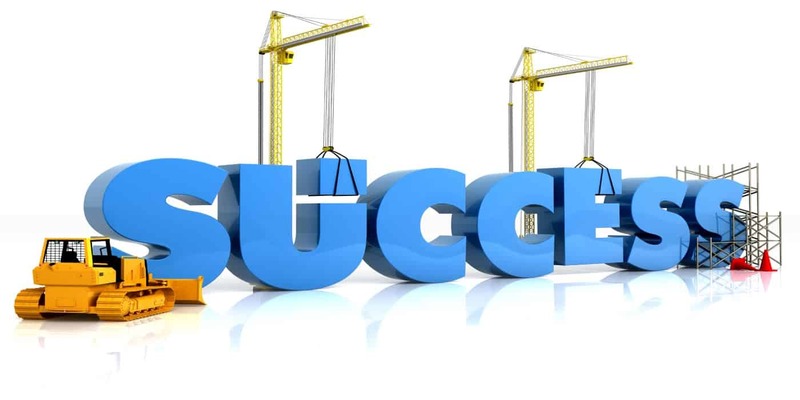 Do you know the ten simple secrets on how to build a successful business? Most people don’t. When I started out, I didn’t. I launched my EdTech right after graduation with no money, experience, or team. And you know what, it showed. You don’t know what you don’t know. I was no exception. I knew there had to be a better way to build a successful business. But where do you look and who do you speak with to figure this out? Success leaves clues if you know where to look. I spoke to billionaires, millionaires, and people who lost their business. I learned both what to do and not do. My EdTech became my laboratory where I experimented. On everything. If you’re looking for the so-called magic bullet and easy street, this article isn’t for you. Accept now that you have to ‘pay’ to ‘play.’ And you pay through your time, effort, and commitment. I discovered that there are ten things all successful entrepreneurs do to build a successful business. Once I knew what to do, I not only built a successful business, I also created a 9-figure exit. Interesting in changing lives, unlocking sweet success, and realizing your destiny? Find and solve a painful problem that you’re passionate to solve. Do this one thing, and you’re well on your way to build a successful business. First, the problem must be painful enough that people will pay you to solve the problem and take the pain away. Second, the painful problem you’re solving affects a large number of people. Read more about how to build a successful business by solving painful problems here. Why do you need passion? Passion gets you through the challenging times, and there will be many. The bigger and more painful the problem, the bigger the opportunity. Build a successful business by solving painful problems you’re passionate to solve? It gets better. You’ll do one other thing, and it’s a big one. You add value to your company should you decide to sell. As the saying goes, if you can’t beat them, join them. Buyers would rather leapfrog the competition and buy your company. My EdTech had a line-up of prospective buyers who would rather buy the solution than figure it out. The customers now had an expanded solution to their painful problem. The buyer later sold my EdTech for a large profit. I had my 9-figure exit. If the problem I solved wasn’t painful, would I still have had my 9-figure exit? Build a successful business by figuring out the 20% of your actions that create 80% of your results. When your company starts to grow, do you know what will hold you back, or worse, put you out of business? Time, not money, is your most valuable currency. Find the 20% of activities that generate 80% of your results. Do this, and you’ll build a successful company. Italian economist Vilfredo Pareto figured this principle out in the late 1800s. Pareto’s law, sometimes called the 80/20 rule, has helped entrepreneurs build empires. Simplify for success so you can dominate and win. My EdTech went off the rails twice. The first time was when my EdTech grew. A lot. Time was not my own. The second time was when I went through the process of selling my company. Pareto’s law and one other thing. What do a billionaire and a pauper have in common? If you want to build a successful company, learn to focus your time, energy, and effort. The research is in, and it’s not pretty. Social media, email, and phone calls are the biggest culprits of your time. Think again, my rockstar entrepreneur. For every distraction you encounter, it takes you 23 minutes and 15 seconds to get back into the flow. The average person has at least 50 to 60 interruptions a day. In other words, left unto themselves, the interruptions make it impossible for you to get back to flow. Saying ‘no’ to every opportunity is saying ‘yes’ to success. Stop multitasking. Focus on one thing at a time. Take back your time and your life. And while you’re at it, learn to do one thing that you’re not doing, at your own expense. Say ‘no’ more than you say ‘yes’ to build a successful business. Want the secret to success? When you first start, say ‘yes’ to everything until you find what works. Saying ‘no’ frees up your time to focus so you can build a successful business. Know that saying ‘no’ to opportunities is saying ‘yes’ to success. Social programming tells you otherwise. You’re taught to say ‘yes’ to be polite, sociable, and respectful. Can I pick your brain for a few minutes? Haven’t seen you in ages. What do you say we grab a coffee and catch up? I have an amazing opportunity that has your name all over it, let’s meet over lunch. Will saying ‘yes’ move me closer to achieving my goal? If the answer to your question is ‘no,’ decline. Saying ‘yes’ when you should say ‘no’ is like a silent thief robbing you of your most precious resource. If you’re selling your company, take note. Time is no longer your own. You’ll be richer and happier when your company runs without you. To build a successful business know that your journey is the true reward. When I started my EdTech, I told myself I would be successful when I reach 10,000 enrollments. When I achieved 10,000 enrollments, I told myself when I reached 25,000 enrollments I’d be successful. 25,000 enrollments became 50,000 enrollments. At the same time, I was miserable. I unlocked the gates of happiness, and my 9-figure exit when I learned to focus on the journey. Where you are right now is exactly where you need to be. This includes the so-called losses and wins. I’ll let you in on a success secret. Your future success is waiting for you. But you’re not ready for it. Your journey is the one and the only thing that prepares you to unlock your sweet success. How do you enjoy the journey? When I’m old and gray and looking back at this moment, will I regret anything? What can I do right now to have me smiling? This worked for me, and it’ll work for you. To build a successful business, know that your journey is both your success and reward. Enjoy the journey, my rockstar entrepreneur. Do you want in on a secret to help you enjoy the moment? If you want to build a successful business, know that you’ll need a team that can you to the moon and back. When it comes to talent, there are two phases for any business. The first phase is the right talent to help you take your dream and turn it into reality. The second phase is where you’ll need to assemble the right exit team to help you sell your business. When hiring for success, personality trumps pedigree. Where do you find and hire your A-Team? I’ve spent countless dollars and time when it comes to hiring the right people. When I finally figured it out, my EdTech skyrocketed to success. Surround yourself with people who are better and smarter than you. When you do this, your company runs without you. Whether you plan to keep your business forever or sell it tomorrow, your set. Either way, you’ll have a strong company with high profits. Most importantly, you have a life. When you have your A-Team, you get to do one thing that will take you and your company to the next level. Interested to know what it is? If you’re chasing after success and coming up short, play to your strengths. You’ll be happier and will build a successful business. Conventional wisdom and experts are wrong in telling you to focus on your weaknesses. I wasn’t. And I failed in every way until I figured out how to play to my strengths. So how do you play to your strengths? Start and read this article. Of all the activities you do, which ones are easy for you? The illustration below helps you find your strengths. 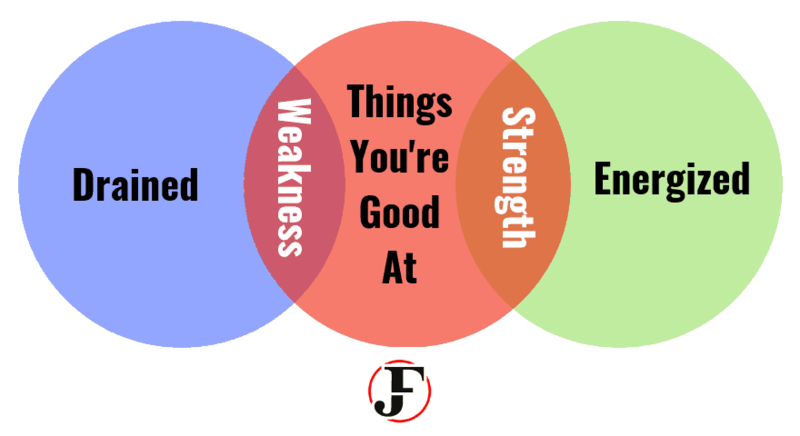 Is finding your strengths that easy? Play to your strengths and you do everything revealed to build a successful business. You free up your time to find and solve a painful problem you’re passionate to solve. The 20% of your actions that generate 80% of your results become a walk in the park. Focusing becomes more natural and easier because you enjoy what you do. You’re energized and motivated to build your A-Team to do all the things you shouldn’t be doing. If you want to build a successful business, play to your strengths. Whether you’re starting or selling your business, know that the experts are wrong. Had I listened to the so-called experts when starting my EdTech, I would have quit before I started and get a j.o.b. The so-called experts gave every reason of why my idea was wrong and how I would fail. The “internet” was a fad, and that I should stop wasting my time, according to the experts. As for your friends and family. Forget about it. Friends and family mean well, but they either aren’t qualified or don’t want you to succeed. Keep your goals, dreams, and vision to yourself or a trusted and qualified mentor. Whether you’re starting your journey and are deep in the trenches, follow your vision. Let your passion be your guide. And when you feel down-and-out, try this next thing that will rock your world. Want to build a successful business? When you do, you’re in great company. Warren Buffett, Bill Gates, and Oprah Winfrey are avid readers. Where else can you have a lifetime of experiences and lessons-learned shared in a few hours? You can’t, except for a book. Know that reading is like exercise for your mind, reduces stress, and can give you new ideas. Reading improves your thinking and analytical skills. Pun intended, read about the benefits of reading here. Many of my biggest breakthroughs happened after reading. Read now, and you’ll thank me later. Know that you only need to be 5% better. Do you know who built a business empire from this philosophy? Walton believed that he only had to be 5% better than his competition to dominate and win. Walmart has created a market disruption and decimated the competition. My 9-figure exit with my EdTech resulted in being better than my competition. Instead, I put my personal touch on changing things up. My EdTech was different enough that it was able to dominate and win. I was the kid right out of school with no money, experience, or team. Failure was my new best friend. How did I go from a so-called failure to a 9-figure exit? I spoke to anyone and everyone who was successful to learn what works, and what doesn’t. What I learned left me speechless. There are ten things all successful entrepreneurs do to build a successful business. In this article, I’ve shared my success playbook. I’ve left out the many failures and heavy lifting and given you the best-of-the-best. Start with the first success secret and master it. Once you’re done, move on to the next. Keep at it every day until you’ve mastered all ten principles. Along the way, you’ll not only build a successful business, but you’ll also claim back your life.